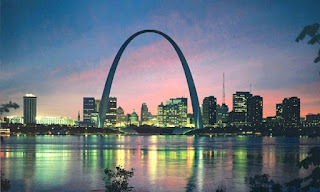 Besides the obvious slight on the Native American’s westward expansion, the Museum of the Westward Expansion in St. Louis at the Arch totally overlooks those who were vital in the westward expansion: the Buffalo Soldiers and even Sacagawea (spelled many ways). There is no way, walking through the exhibit, that one would realize that Sacagawea accompanied Meriwether Lewis and William Clark as a vital interpreter to obtain horses, that she was their guide across the Rocky Mountains, or that she assisted them in negotiating with the Shoshone. Also missing was the Buffalo Soldiers' vital role in protecting the new frontier and making way for the westward expansion. 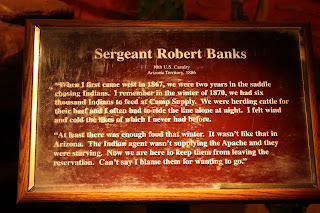 Robert Banks plaque at the Museum of the Westward Expansion. There is a lone plaque of Sergeant Robert Banks in front of a talking human size figure. It does not mention that he was a Buffalo Solider; it only states that he was in the 10th Cavalry. It failed to explain the purpose or importance of the 10th Cavalry, the original Buffalo Soldiers. It even failed to explain that Robert Banks, an original member of the 10th Cavalry, began serving July 1866 and enlisted 4 times, to complete over 15 years as a soldier. Note: There is a small unmarked/unexplained photo of a group of Buffalo Soldiers on the “Soldiers” wall. Who Were the Buffalo Soldiers? On 28 July 1866 Congress passed an act to establish two cavalry regiments of “colored men – The 9th Cavalry activated in Greenville, LA and the 10th Cavalry activated in Fort Leavenworth, KS. The 9th and the 10th Cavalry Regiments were used to contain the Native Americans. In addition to the two all black Cavalry Regiments (with white officers due to the laws of Congress at the time), there were two all black Regiments: 24th Infantry and 25th Infantry. A good place to learn about the Buffalo Soldiers: Google Books “The Buffalo Soldiers – A Narrative of the Black Cavalry in the West” by William H. and Shirley A. Leckie (online). Cathay Williams is the only known woman Buffalo Soldier. She was an ex-slave who after being freed by the Union Army during the Civil War, worked as a cook and laundress for the military. 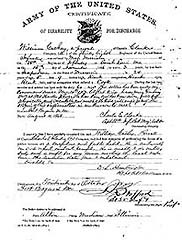 After the Civil War she enlisted in the 38th Infantry, Company A as William Cathay. After about two years of service, she feigned ill and through a medical examination, her gender was revealed and she was discharged, which was her desire. For more information and to see enlistment and discharge documents, see http://www.buffalosoldiers-lawtonftsill.org/williams.htm. The Buffalo Soldier Monument was proudly dedicated 25 July, 1992 at Fort Leavenworth, KS. I knew what Buffalo Soldiers were but never took the time to read its full history, you have given a great summary and now I know lots more about them. No I can relate to the Bob Marley song Buffalo Soldier.